A .40 caliber handgun round is sometimes teased as “short and weak” because it’s a slightly smaller 10mm bullet. But despite its size, it’s an excellent in-between, a slight step up from a 9mm and not as powerful as the larger .45 caliber. The .40 caliber round gives more recoil than a 9mm does and has been proven to be a capable self-defense round. Handgun ‘stopping power’ should be your number 1 consideration when deciding to carry a pistol for defensive purposes. A round is not effective in a defensive carry situation if it won’t stop a bad guy in his tracks, ideally with one shot. The .40 caliber is the Goldilocks round for many firearm makes: just small enough to fire in either small, medium, or large handguns, but mild enough to perform well. Of course, the “best” ammo will be different for self-defense and target shooting. We’ll give you the best possible information based upon the latest testing and ballistics information. For your information, the definition of ballistics is the science of mechanics that deals with the launching, flight, behavior, and effects of projectiles, especially bullets, unguided bombs, rockets, or the like. Ballistics numbers give you information on bullet velocity (speed), penetration depth, expansion (in the case of hollow points), and much more data. You can use these numbers to compare different calibers and even different bullet weights in the same caliber. Check out this Handgun Ballistics Chart so you can use the numbers to compare different .40 caliber grains. Ballistics data gives you information on how fast a round exits the muzzle, how much penetration you can get from the bullet, and the rate of descent of the bullet over specific distances. This information combines to tell you how a bullet is likely to perform. Shots were made at a distance of 10 feet. Testing included 4 layers of cloth to simulate an actual bad guy. This will help to guarantee your round will penetrate even the heaviest of winter clothing. Ideal penetration sought was 12 to 18 inches; you don’t want over-penetration, but a hollow point needs enough distance to properly expand. They did 5 shots with each brand to get an average number for their data. The shooter used a short-barreled handgun, in this case a Glock 27 with a 3 ½-inch barrel; most concealed carry shooters choose shorter barrels. You’ll get higher velocity and penetration numbers when you use a longer barrel on your pistol. Keep in mind bullet grain(gr) as this will make a difference in ballistic information. You’ll find the grain of your ammunition on the box. 165 or 180 grain rounds are good bullet weights for target practice. And for self-defense, hollow points are the choice of most shooters; they provide maximum penetration and stopping power. When you consider self-defense ammunition, a bullet’s effectiveness (also called ‘stopping power’, mentioned above) is related to how the bullet is made. Lead is a soft metal, so bullets made solely of lead aren’t an excellent choice for self-defense rounds, but are okay for target practice. Hollow points are ideal for defensive use, but because of their price, you wouldn’t want to use them for target practice on a regular basis. Remember when testing to use the best ear protection for shooting available. Full metal jackets, often shortened to FMJ, have a core, usually made of lead, surrounded by a copper jacket. These bullets penetrate well, but without expansion, there is relatively little damage done by the round as it passes. They can also completely penetrate and go on even further, potentially injuring innocent bystanders, something you want to avoid. But, FMJ rounds are excellent for target shooting. For self-defense rounds, the best choice is probably a jacketed hollow point, often called JHP. The lead core of these bullets will expand upon impact, transferring energy and creating a larger damage path. But they’re still jacketed in copper, which slows the expansion so that the energy transfer and penetration are balanced. These rounds are not likely to completely penetrate a target and keep going. Some manufacturers are using a process called bonding to secure the jacket to its core. This is to prevent premature separation of jacket and core in hollow point rounds. There are two different ways the manufacturer might bond their rounds to the casing. An electrochemical bonding essentially welds the lead core to prevent separation of core from jacket. A mechanical bonding uses a knurl or cannelure, a kind of lip to physically prevent separation. 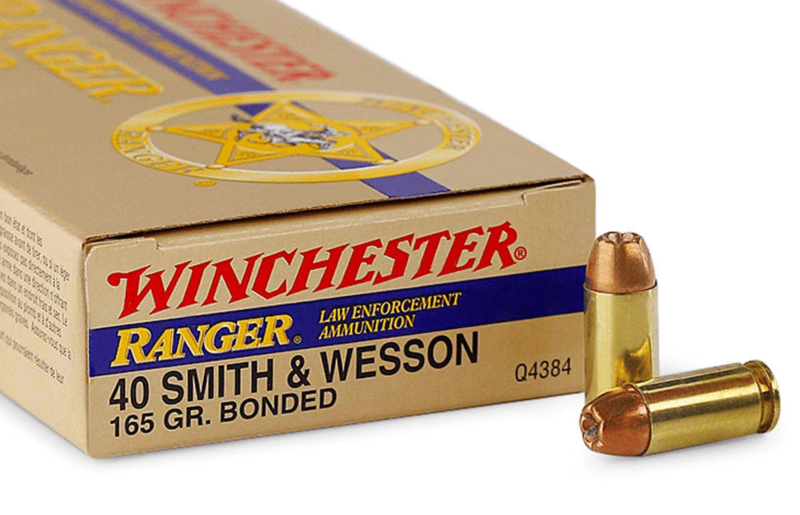 For self-defense ammunition, bonded rounds are becoming more popular and are the go-to defense round for many shooters. The cost of these rounds makes them prohibitive for target shooting, though. For target practice, stick with full metal jackets. 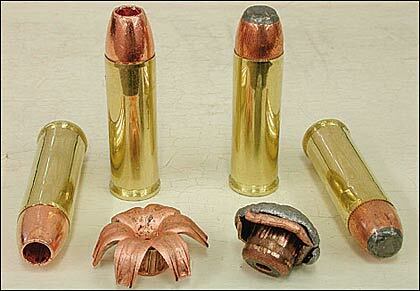 Okay, now you understand the differences between full metal jacket and hollow point rounds. You’re ready to get down to the meat, to learn more about specific brands of .40 caliber ammo. Let’s start out with defensive rounds. A word of caution: whatever defense rounds you choose to carry, you should always try a few of them out when you first buy them. Some firearms may have some issues with some ammo, so it’s a good idea to test them. I once had a Taurus Millenium 9mm that refused to properly feed Federal Expanding Full Metal Jacket ammo. Flat-out refused! That’s not to say it’s a bad firearm or bad ammo. The two just didn’t mesh to operate properly. 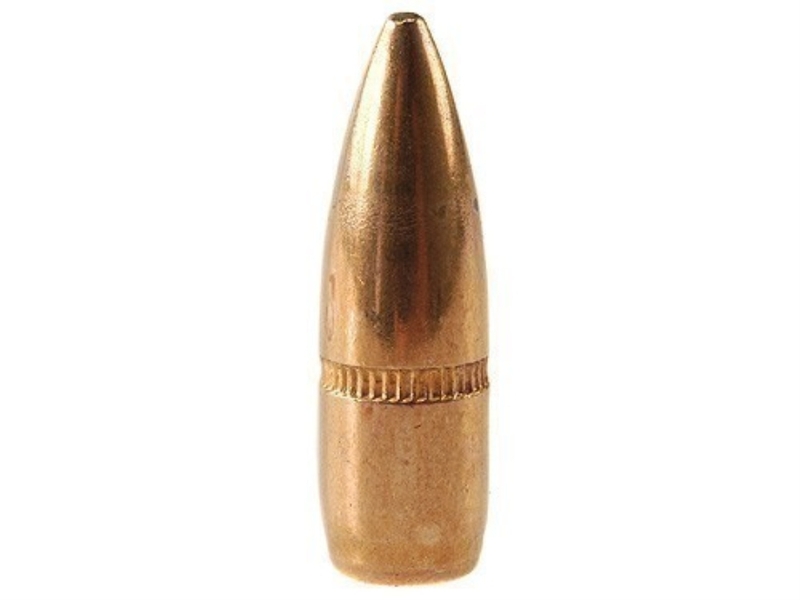 This jacketed hollow point (JHP) ammunition was designed to deliver a maximum penetration regardless of potential barriers. Winchester’s special core/jacket bonding aids its effectiveness and is enhanced by the hollow point to control expansion. The 180gr Ranger is often chosen by law enforcement agencies. Average penetration was 16.9 inches. Average expansion was 0.72 inches. Average velocity was 930 ft/sec (feet per second). This round is a jacketed hollow point (JHP) designed for controlled expansion and huge knockdown power. It also contains a waterproofed and treated powder to reduce the muzzle flash. These rounds come in two types: for full-sized and compact handguns. The Ultimate Defense Golden Saber bullets expand at lower velocities even through heavy clothing. Muzzle velocity is excellent for short barrels. Average penetration is 15.5 inches. Average expansion is 0.79 inches. Average velocity is 977 ft/sec. 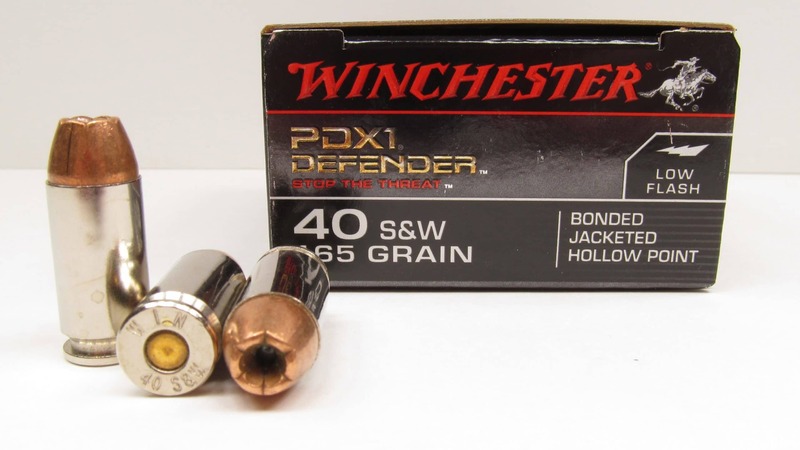 The 165gr PDX-1 jacketed hollow points (JHP) are bonded with Winchester’s proprietary core to jacket bonding process. They are lighter in weight than the 180gr Rangers, but provide excellent penetration for their weight. These rounds also offer impressive expansion and speedy velocity. Average penetration is 14.6 inches. Average expansion is 0.74 inches. Average velocity is 1,066 ft/sec. 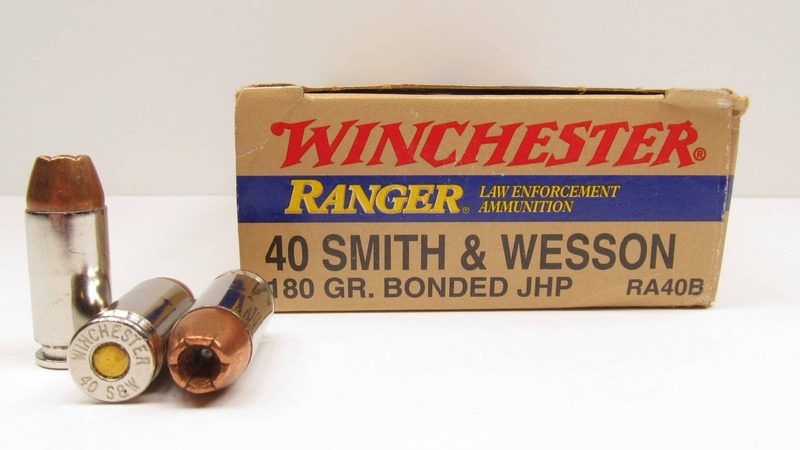 These are the same jacketed hollow point (JHP) rounds as the 180gr Rangers, only in a lighter weight to reduce recoil. They have Winchester’s core to jacket bonding and are hollow points designed to produce penetration even through heavy clothing. They are also ideal rounds to handle abrasive surfaces such as automotive glass. Average penetration is 14.7 inches. Average expansion is 0.77 inches. Average velocity is 1,098 ft/sec. When talking about target ammunition, cost is probably the major factor. Target practice uses up a lot of ammunition, so the best ammo for the cheapest price is ideal. On the other hand, cheap ammo comes with reliability issues, so keep this in mind whenever you purchase target ammunition. The brands mentioned below are readily available and we’ve listed them as “assorted” rather than by specific make. These full metal jacket (FMJ) rounds come in reloadable brass cases (if you’re into reloading target ammo yourself). Their special CCI primers insure reliable firing, and they’re filled with clean-burning propellants. Besides the .40 caliber, these rounds are also available in 9mm Luger, 380 Auto, 38 Special, 357 Magnum, and .45 auto calibers. 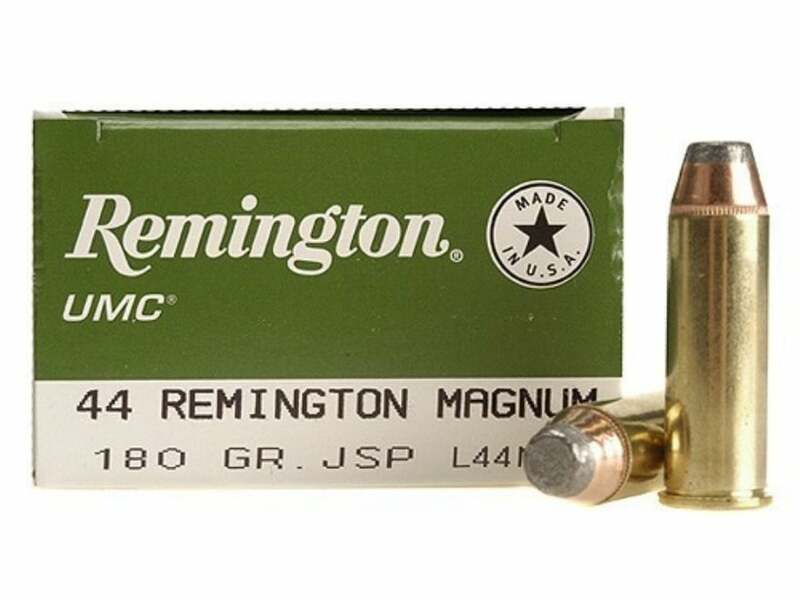 There are various rounds available from PMC for target shooting, but the link above will take you to the 165gr bronze full metal jackets (FMJ). Regardless of the type of pistol you use, you need to select the right type of ammunition to use. If you’re dealing with self-defense or everday concealed carry, you’ll probably want to choose a hollow point type round because it will penetrate with enough expansion to stop a bad guy. This is your ultimate goal when carrying for defense. And bonded hollow points are increasingly sought after as personal defense rounds. For target shooting, a standard full metal jacket will likely be sufficient and are far less expensive than hollow points. The grain of the rounds you choose will make a difference in your recoil, as lighter rounds will offer less recoil when fired. But full metal jackets are not recommended as defense rounds because they may over-penetrate your target. Hi there, I'm Will and I'll be your guide. Here at Gun News Daily, we support guns for self defense and and competitive shooting. We believe that America should be free and support the 2nd Amendment. Good info. I’m new to guns and that was very helpful.